Why? Because FINES shouldn't be a barrier to library use! Basalt goes Fine Free for Youth and Young Adults! The Basalt Regional Library District (BRLD) wishes all families and caregivers to frequent the Library and utilize its variety of services without hesitation due to overdue fines. By eliminating socio-economic barriers, the Library aims to level the playing field and provide free and equal access to all information. September 1, 2018. 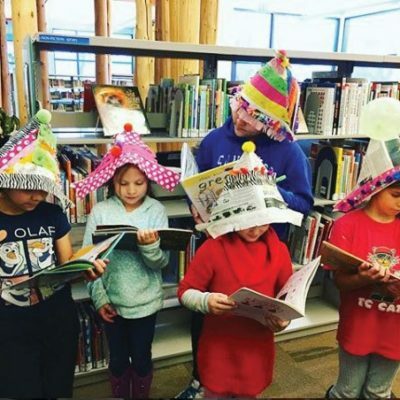 The Basalt Regional Library District will eliminate all existing overdue fines in the accounts of patrons aged 3 – 18 and materials in the Juvenile and Young Adult categories. Does the elimination of late fees also apply to larger items, such as: ukuleles, book packs and DVDs? Yes. However, replacement fees for lost or damaged items still apply. Do old fines carry over? No, old overdue fines will not carry over. However, all fines relating to lost or damaged items will carry over to cover replacement costs. Patrons may submit a written formal appeal asking for a reversal of replacement charges. Do I get a refund if I just paid my late fines? No. The Library truly appreciates your responsible behavior. The new policy is effective September 1, 2018 and its benefits are not retro-active. Are Due Dates still applied to materials? Yes. Most items are checked-out on a 3 week loan (with the exception of DVDs having a 2 week period and music CDs having 1 week). Patrons still need to return or renew their items on time. How long past the due date before an item is considered lost? 60 days after the due date an item will be considered lost and replacement fees will be charged to the patron. Aside from late fees, are any other fees changing, such as replacement costs? No. Replacement charges will remain the same. Only overdue fines will be eliminated. However, our circulation policy has increased to a majority of items having a 3 week check-out period (with the exception of DVDs having a 2 week period and music CDs having 1 week). Is the Library financially dependent on overdue fees? No. It is historically true that the earliest public libraries used membership fees and overdue fines to buy materials and maintain their buildings. However, as public libraries have progressed into vibrant community staples, their finances have diversified. The BRLD primarily operates on local property taxes, as well as other state, federal and grant monies. What will happen to charities previously tied to “fine amnesty,” such as the Colorado Food Bank? The BRLD will continue to hold food drives to benefit the Colorado Food Bank. And, we will continue to partner with other local and state charities. Why does the new policy only cover patrons aged 3 – 18 years old and materials in the Juvenile and Young Adult collection? Fine Free Basalt aims to fully welcome children and their families as frequent library patrons. Promoting consistent library usage will benefit these individuals in a variety of ways for years to come. Fine Free Basalt is designed as a 1 year pilot program; after which time the BRLD will re-assess the policy and determine whether it is a beneficial policy change for all patrons. Beginning September 1, 2018 all new library card applicants must be at least 3 years old. The BRLD believes that 3 year olds are aware of the benefits and privileges of being library card holders. Gaining their library card is a memorable act of positive community engagement. The majority of patrons under the age of 18 are dependent upon parent or bus transportation. They should not be negatively impacted by their inability to independently access the library. Thank you to the Sopris Sun for covering our decision to end overdue fines for children & teens!